Hello, world! 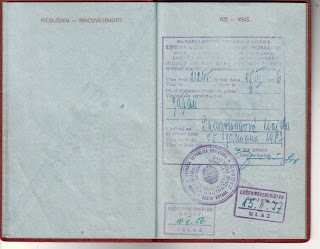 So as you may have already guessed from the title, this blog will be devoted to showing passport chops and immigration paraphernalia. Not much to say or show, is there? Well, you may be surprised. 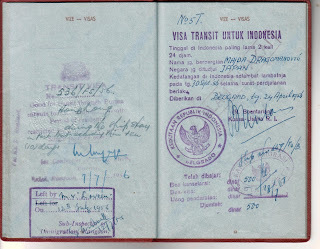 While I will try my best to post my personal passport chops and passport chops only, I will from time to time come up with posts on things that may interest those others out there to read my blog. I really am not writing this for anyone but myself as who would be so interested in immigration law, passport stamps, and visas as I am? 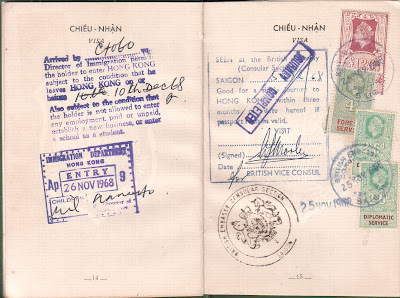 I'm pretty sure that most will not find this blog very interesting, but I do hope that there is a readership out there as enthusiastic as I am about immigration, passports, and visas. 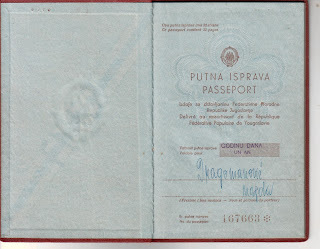 Judging from the number of passports from the former Yugoslavian Federal Socialist Republic that were used for foreign travel, it seems to me that the Yugoslavian government was not as strict on their citizens as other socialist or communist states when it came to leaving the country. And this was not a more recent development, either. As far back as the 1950s, when the communist government was still young and the ideology still strong, the average citizen seemed to have already enjoyed a fair amount of mobility. 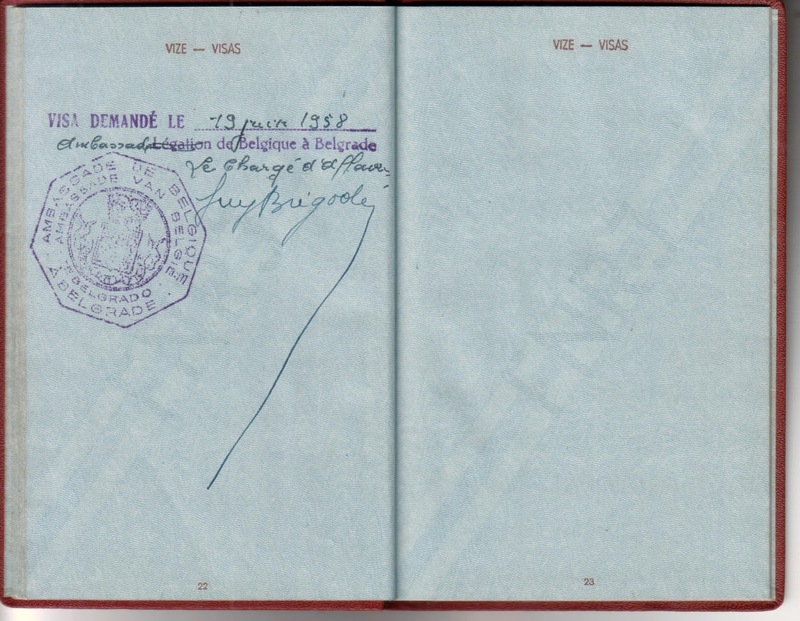 Most of the passports I have seen had the usual European countries: Germany, Austria, France, Britain, Switzerland and Italy, to name a few. Occasionally, there were even passports used for travel to the United States and Canada! 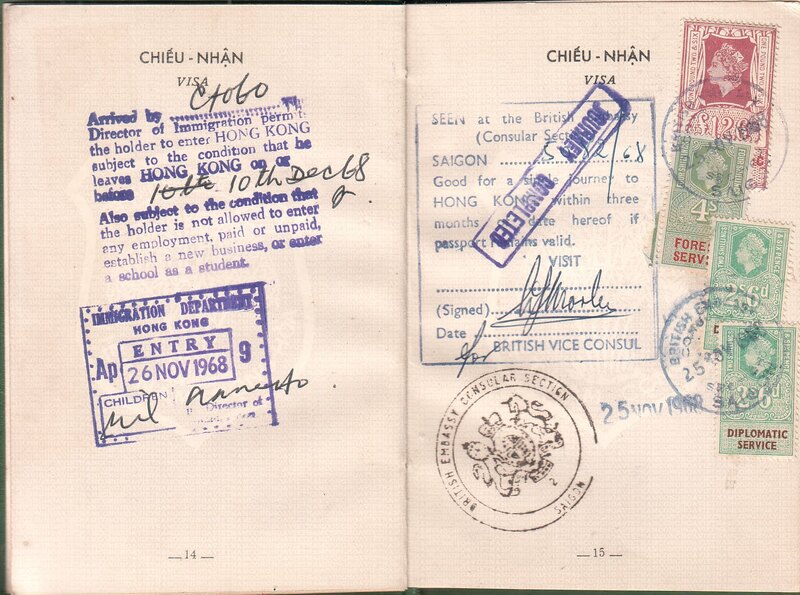 Rarely, however, have I seen passports used for travel to Africa, Asia, and South America, let alone Australia. 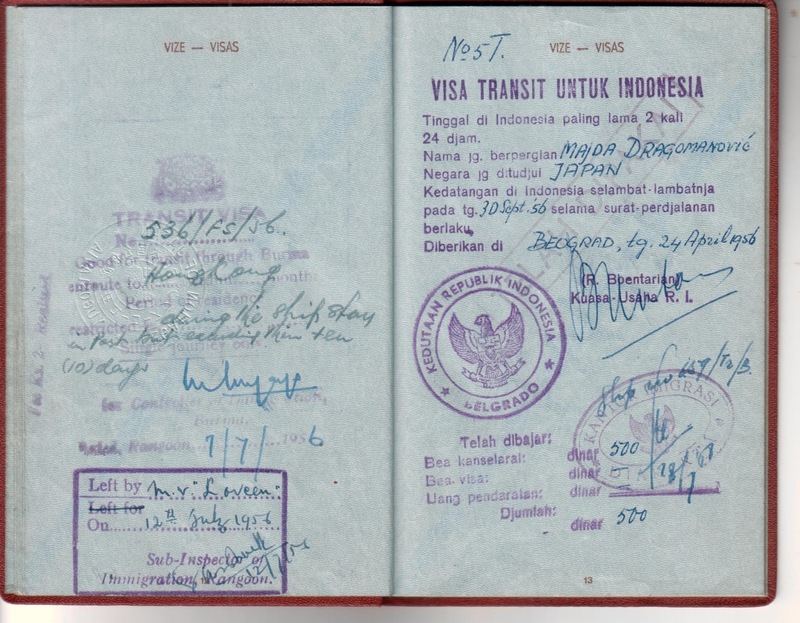 This is why I was very excited when I saw this passport, which was used for travel by sea to Japan. It must have been an exciting voyage to go by sea. Of course, you would have to deal with the boredom of seeing the endless flat, blue horizon of the sea, and perhaps seasickness as well, but the thrill and excitement of seeing a different city with different people speaking a different language at each port of call must have made up for it. 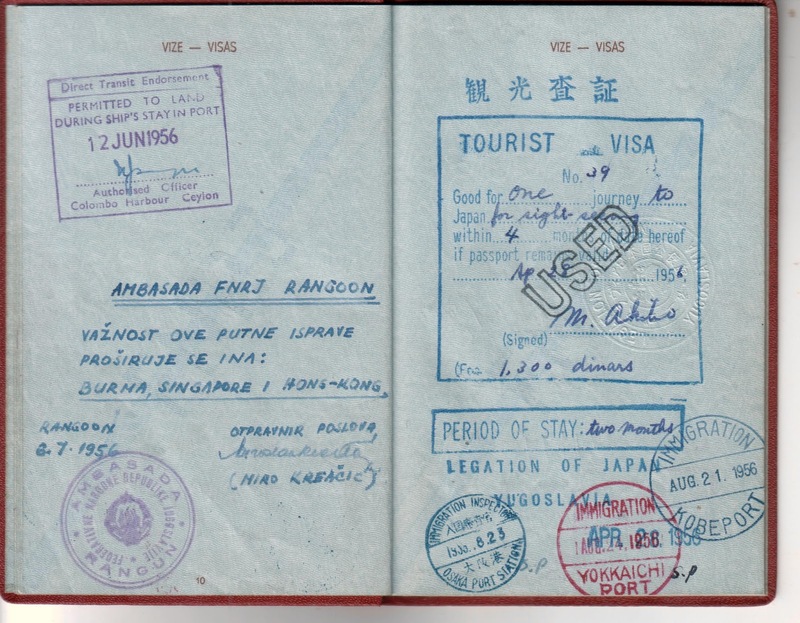 In 1956, when the thirty-five-year-old Croatian lady embarked on her journey, air travel to Asia was already possible. 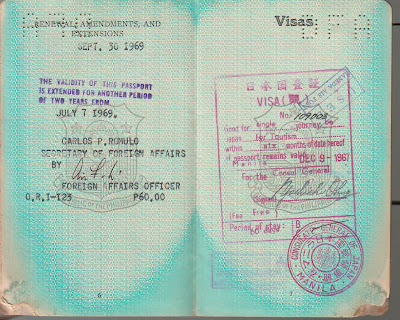 While it was probably very expensive, it was not impossible, and the route to Asia would have probably taken you to the Middle East, then the Indian subcontinent, then on to the Malay Peninsula, and then to Hong Kong, from where you might take a flight to the Manila, Taipei, or Tokyo or, if you were lucky enough to acquire a travel permit to enter communist China, Shanghai or Beijing. 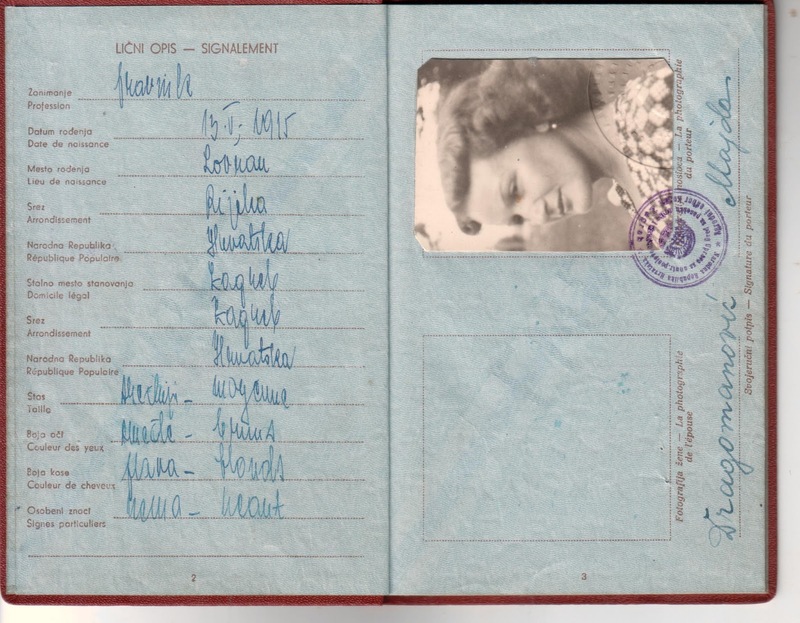 The fact that air travel was possible at the time (although it would admittedly cost a pretty penny) makes the story of this lady, Ms. Majda Dragomanovic, even more interesting. If she didn't have the money to fly, then it means that she was not a member of the "elite" of her society, which I imagine comprised mostly of government officials and their cronies. Of course the fact that she went to Japan in itself is very interesting. Why was she there? Was she paying someone a visit? Did she do some kind of work? 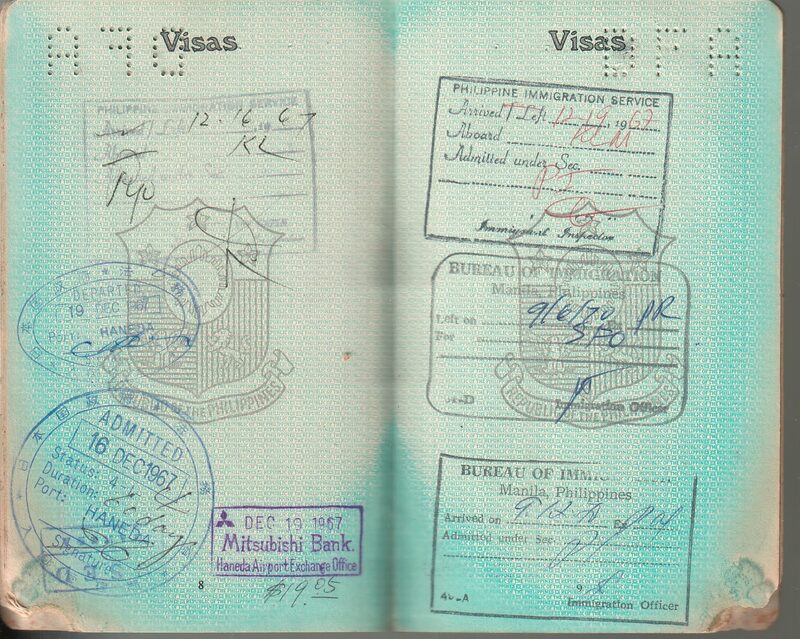 And, if she did, it was certainly not diplomatic work since this is not a diplomatic passport and it does not carry a diplomatic visa, but rather a tourist visa. But how much touring did she do? She stayed for almost three months! There were many Americans stationed in Japan at this time. Was she perhaps visiting an American GI whom she met in Europe somewhere during the war and fell in love with? 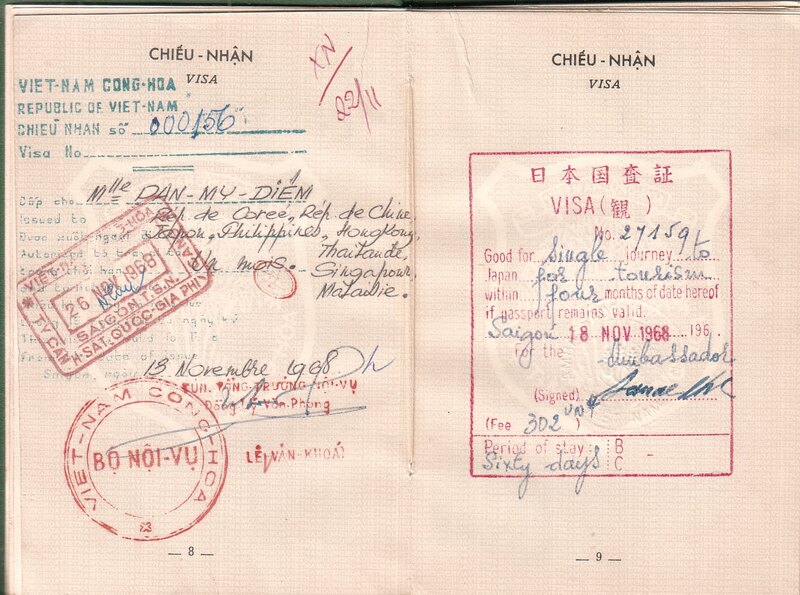 Or was she just simply interested in the exotic country in the far, far East? And, if so, had she saved up all her life to go? We have to remember that even sea travel was probably not too cheap and that she was coming from a socialist state, where you can't really "save money" since wages are so low since the economy is controlled. So where did she get all the money? Was she sponsored by her lover, who was a member of the government? Or did she work on the ship? Or did she do other types of work to earn easy money? Hers must have been one heck of a story. 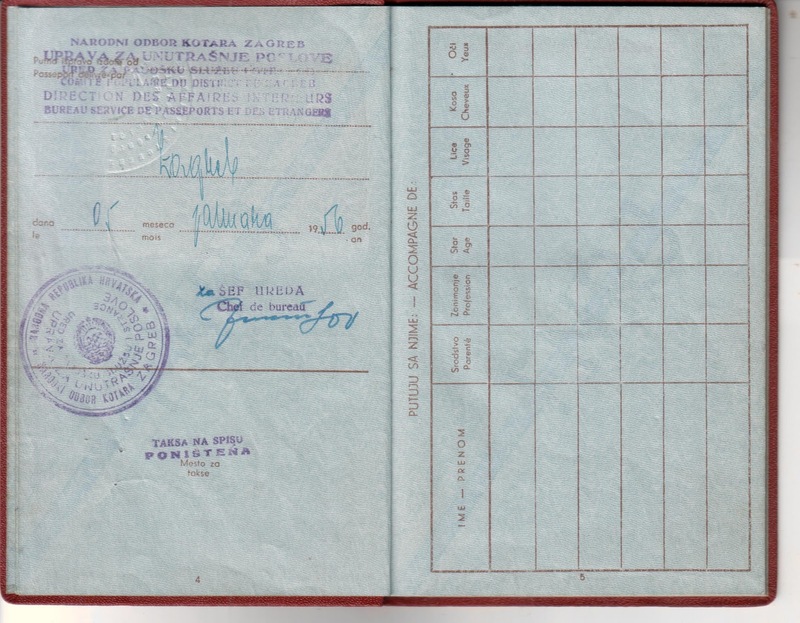 It is interesting to note that, just a little over a year after her return from her Japan trip, she renewed her passport and applied for travel permission to a few western European countries and that she was even issued a visa for Belgium. 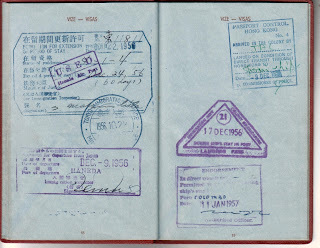 However, for some reason, the passport has no further entries. Was it because she noticed that she no longer had enough pages to fill in her passport and therefore got a new one for her next trip? Or did she run out of money for another trip and therefore decide not to go? 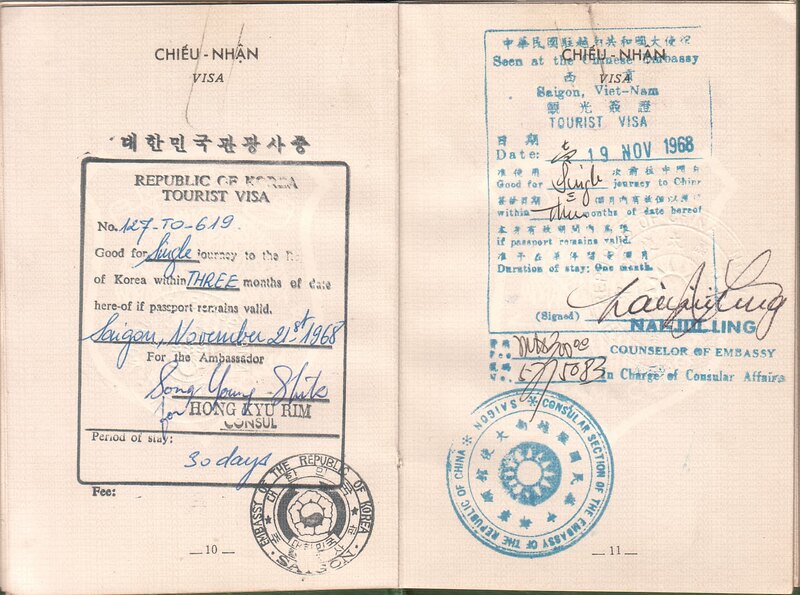 Was she denied other visas (although I doubt she was)? Did she no longer have a reason to go West? On a final note, it seems that her documented intention to travel to European countries after visiting Japan makes it more probable that she was also in Japan on vacation for some sightseeing. 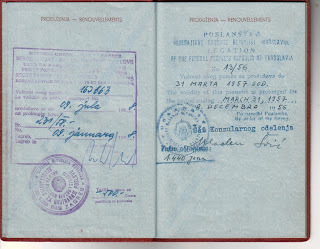 In any case, this passport is surely an interesting piece with an interesting story to match. 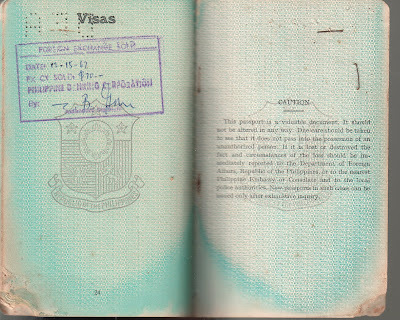 Here is a passport that I have been wanting to have for quite some time now. It is not very easy to find Philippine passports issued before the 1970s not only because not many people were issued passports, but also because many are kept by the bearers' families long after they are gone. Unlike in most Western societies when the personal effects of someone who has passed away are sold off in estate auctions, given away, or simply dumped in the garbage, Filipinos tend to keep them as remembrances of their departed loved ones. 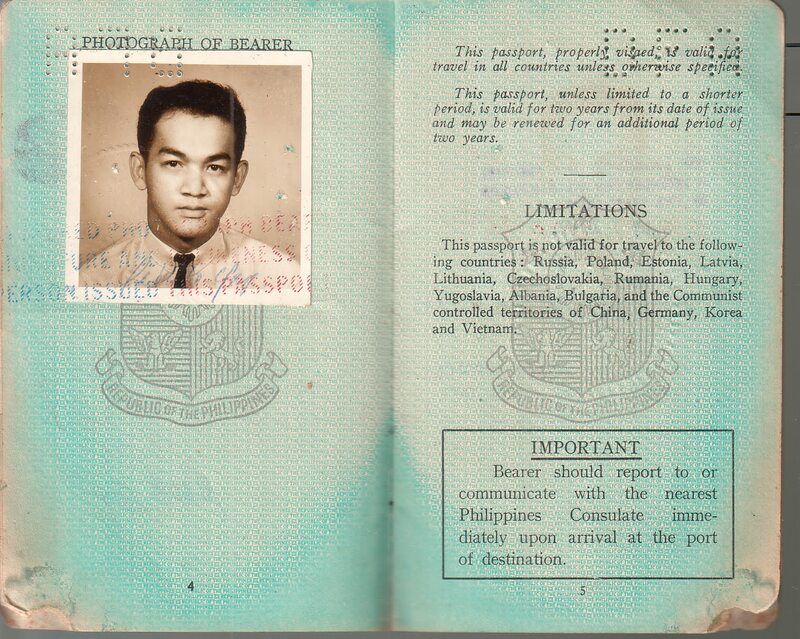 Also, the fact that your predecessor was issued (and used) a passport in the olden days is a sign of affluence and one would certainly like to hold onto that. 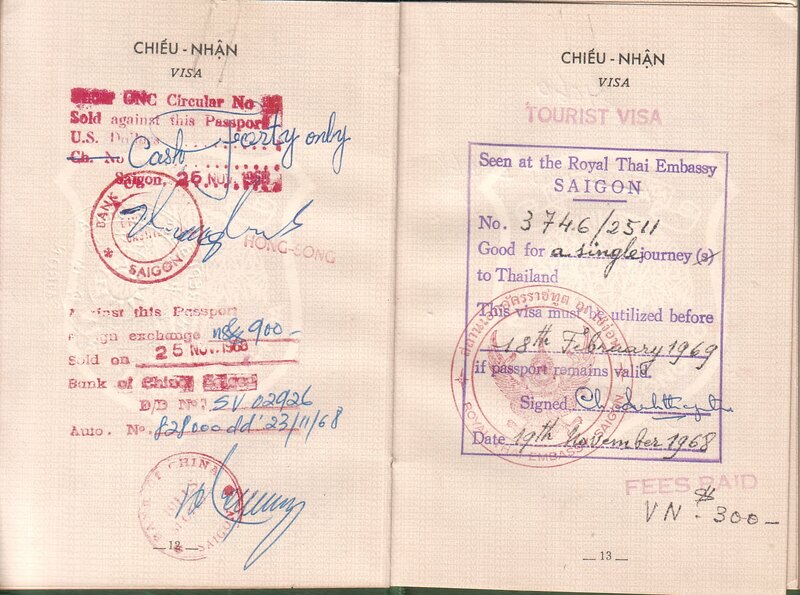 That is why I jumped at the opportunity to nab this passport when I saw it on eBay. 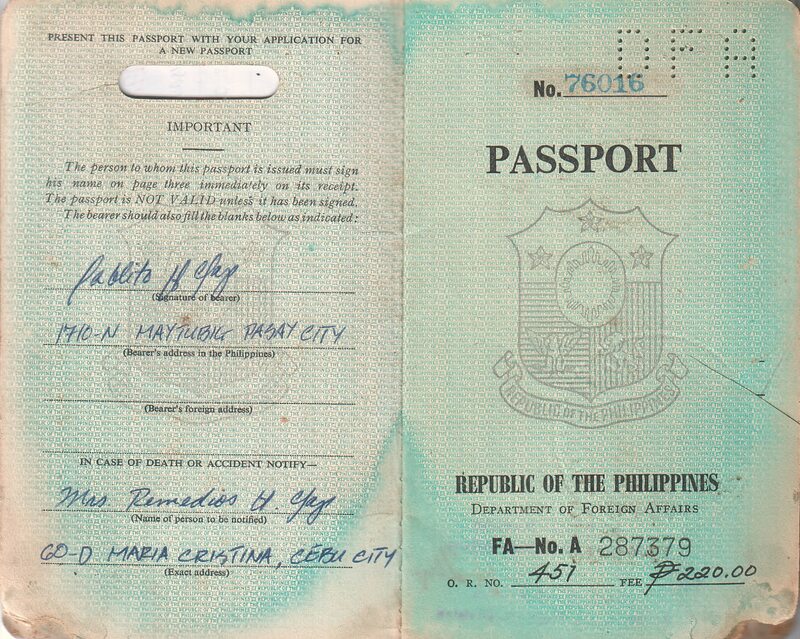 Perhaps some other collectors out there also have a gap in their Philippine collection as the bids for this old thing were very high, especially considering that this is a damaged passport (it was wet and it seems a rat or some termites ate off part of the edges) and the visas and stamps inside are not very interesting - there aren't even any revenue stamps! Nonetheless, I certainly wouldn't let this big fish get away! And so I am proud to present it here. This passport belonged to a Chinese Filipino (Chinoy) student born in Manila and living in Pasay City at the time. What is interesting is that the person to contact in case of an emergency lived in Cebu, so I wonder if his family was originally from there and not Manila. 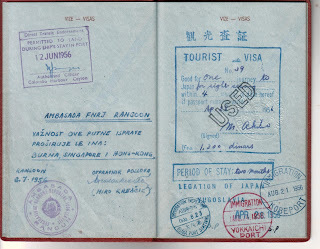 This young man travelled to Japan and the United States on this passport. 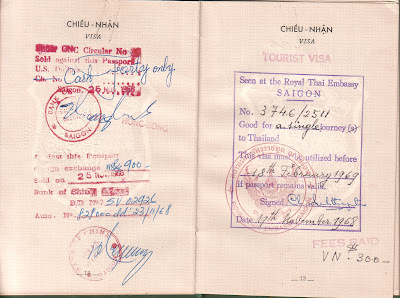 Surprisingly, he spent only a few days in each country on both trips. Was he there for academic purposes? For a conference or a contest, perhaps? 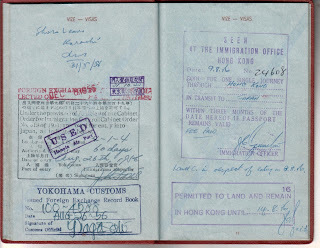 An interesting stamp from his Japan trip is one that indicates that he exchanged $19.05 at the Haneda Airport Exchange Office of Mitsubishi Bank on 19 Dec 67, the day he left on his flight back to Manila. I am guessing he thought it would be wiser to exchange his Japanese Yen into USD dollars in Tokyo rather than exchange then into Philippine Pesos upon his return to Manila. Perhaps the exchange rate for the Yen was bad back home? 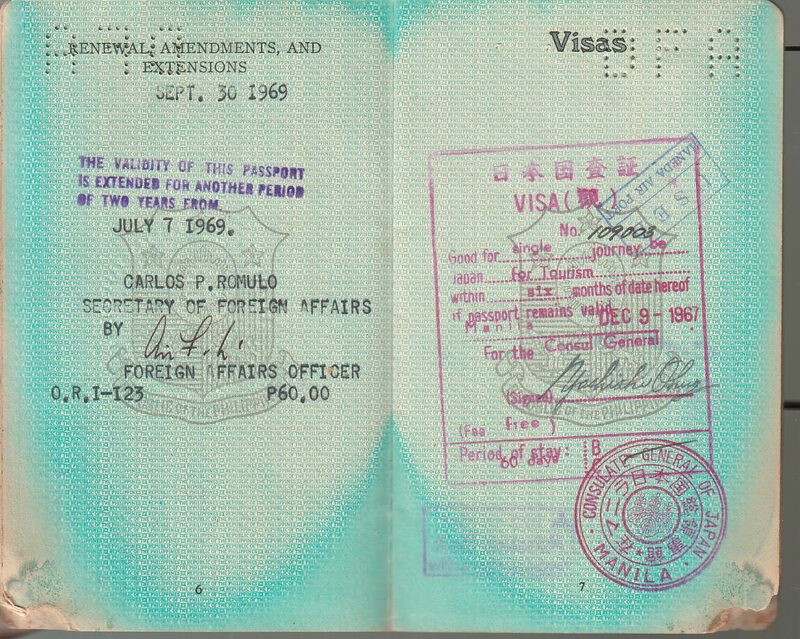 His port of entry for his US trip is Honolulu, but I think it was just a stop-over on his way to San Francisco as his Philippine departure stamp indicates "SFO" as the destination. Because the flight was long-haul, most planes at the time (no jets yet!) would stop over in Hawaii and/or Guam on their way to the mainland. 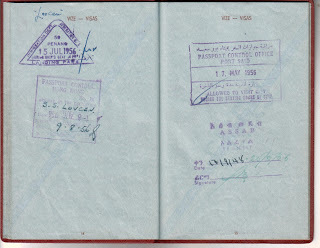 The passport itself is very similar to US passports issued at the time. 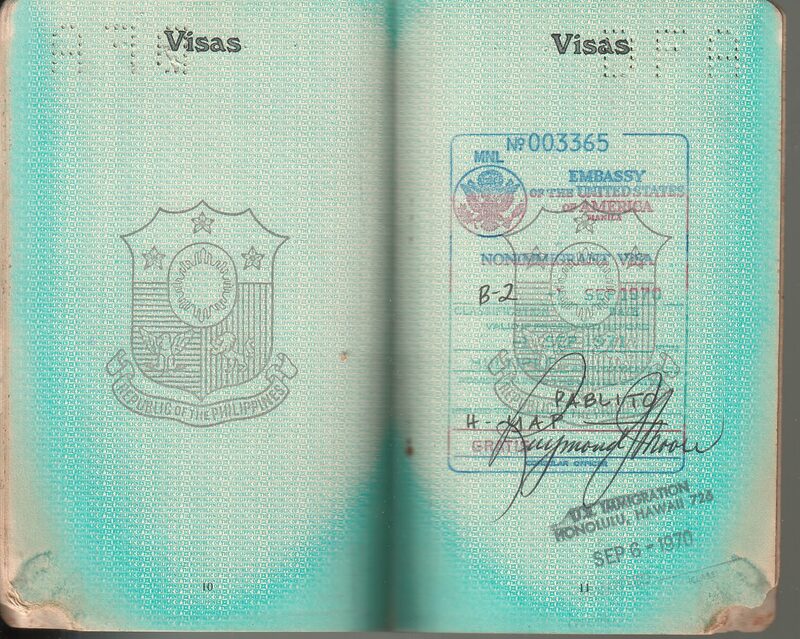 Like its contemporaries from the US, the Philippine passports had windows on the covers to show the passport numbers indicated inside. 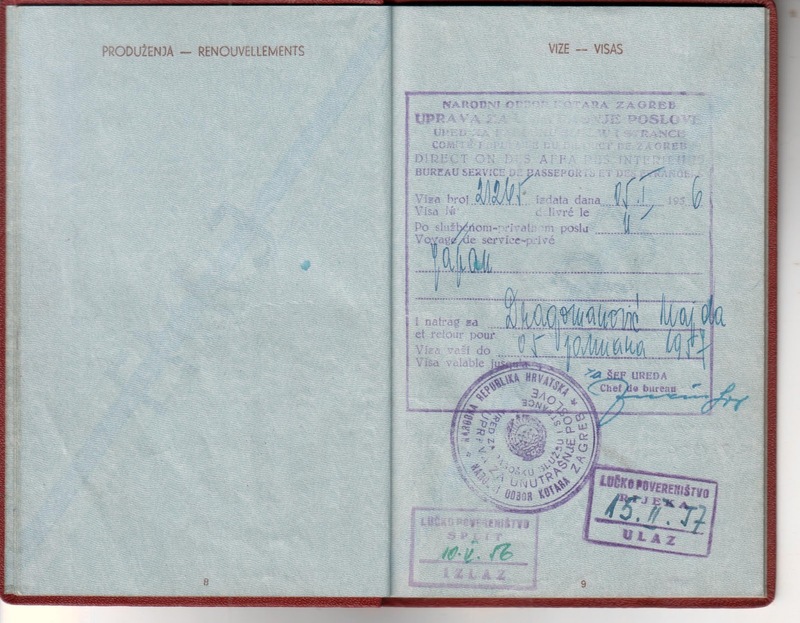 There are also spaces for the bearer's address as well as the address of an emergency contact in the same area: on the inside of the front cover. 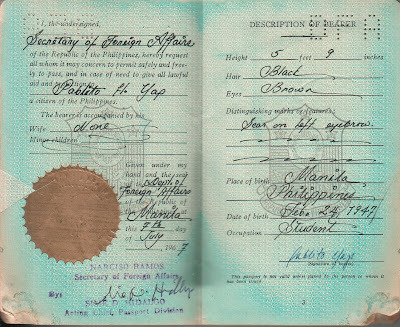 The layout of the information pages are also similar to those of US passports in the 1940s (the Philippines gained independence from the US in 1945) and the perfin on the upper right that reads "DFA" (for Department of Foreign Affairs) is similar to the perfin on the US passports at the time which read "USA." 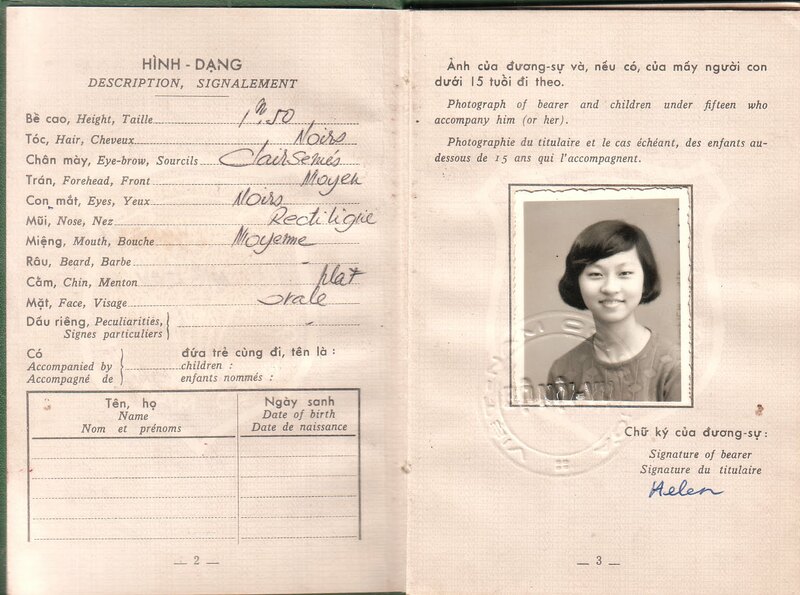 Here I proudly present what I believe to be a neat piece of history: a South Vietnamese passport issued in 1968 during the Vietnam War to nineteen-year-old young lady. 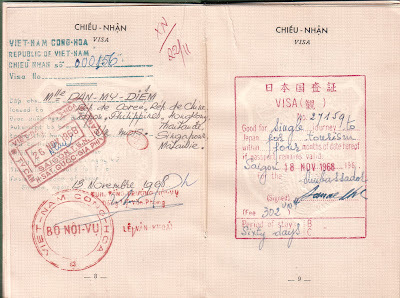 I suppose she was among the well-to-do in Saigon, where she lived, as I am sure not many people at the time had the means to travel outside the country by air. 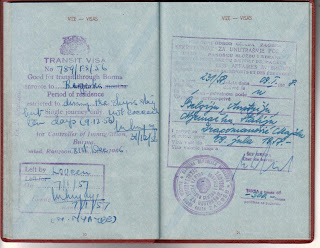 Note also that the passport number is 00085, which might hint that either (a) passports at the time were issued few and far apart, so having one means you are among the fortunate few, or (b) this young lady was among the very first to receive a passport when they began issued them, which means she was among those of influence and power. There is also the possibility that (c) they simply ran out of serial numbers and so started from 000001 again, but I would prefer (a) or (b). 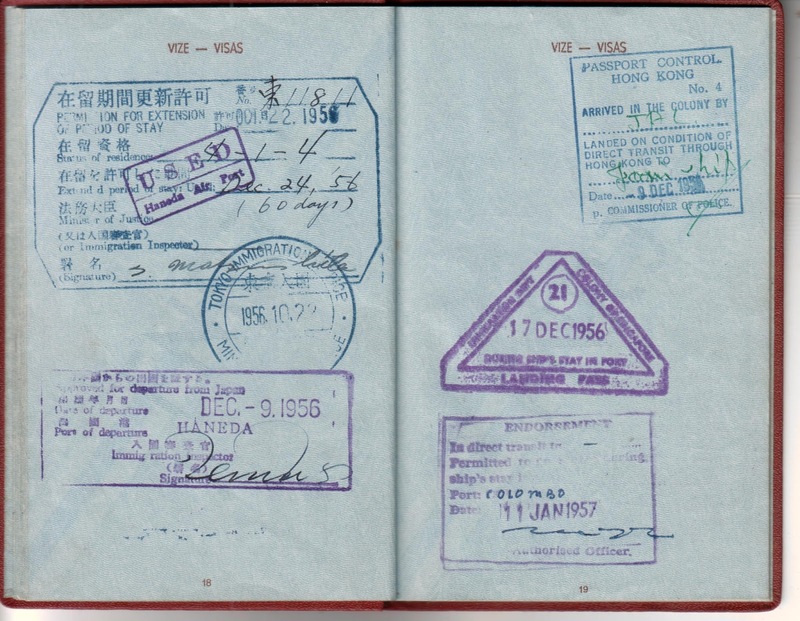 Also interesting is the fact that many visas were granted to the passport holder, but only one was used: the one for Hong Kong. 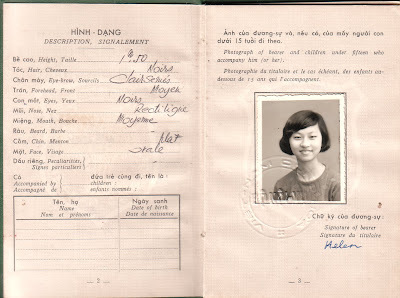 This, plus the fact that there is no Hong Kong exit endorsement on this passport, leads me to believe that the reason why this young lady applied for all these different visas was to give immigration officials the impression that she was embarking on some sort of tour of Asia. 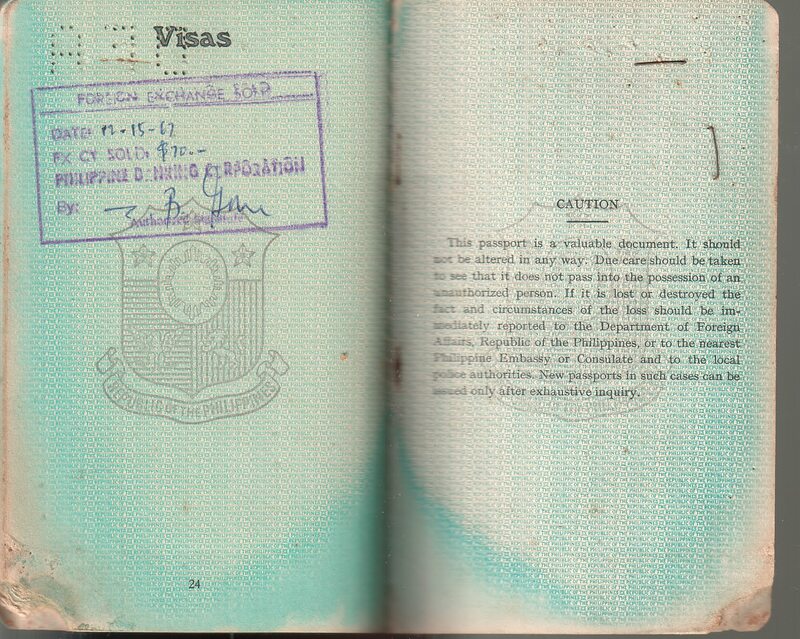 In fact, the passport was valid only for travel to South Korea, Taiwan ROC, Japan, the Philippines, Hong Kong, Thailand, Singapore, and Malaysia; and she procured visas for all of these countries (except the Philippines, Singapore, and Malaysia - perhaps they did not require visas?) without fail. This was probably done to boost the credibility of her story. 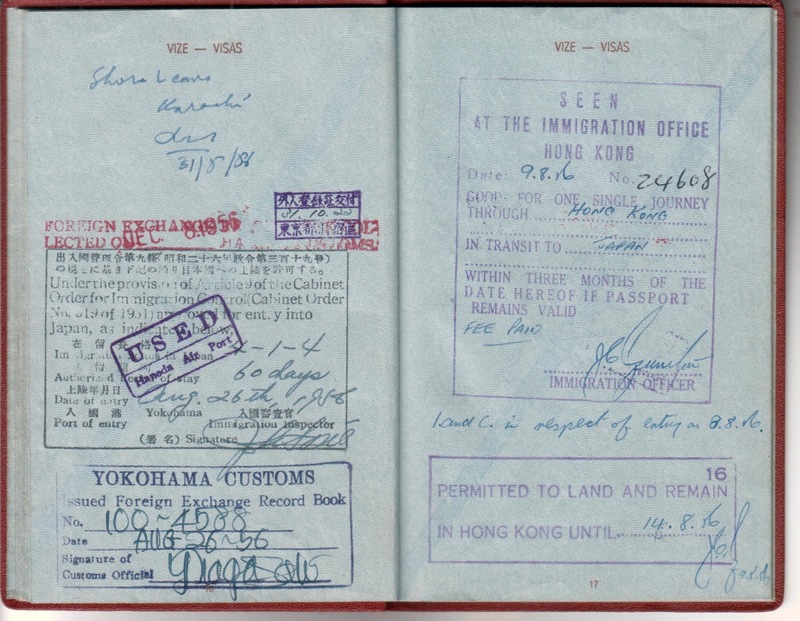 To further support my theory that the young lady's real intention was to flee to Hong Kong, the evidence shows that the very next day after the issuance of her Hong Kong visa, she took off on flight CX060 bound for Hong Kong! 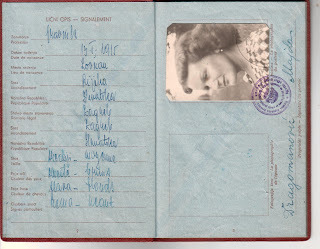 I imagine that she fled with her family, although there is no evidence on this document that would support that theory. 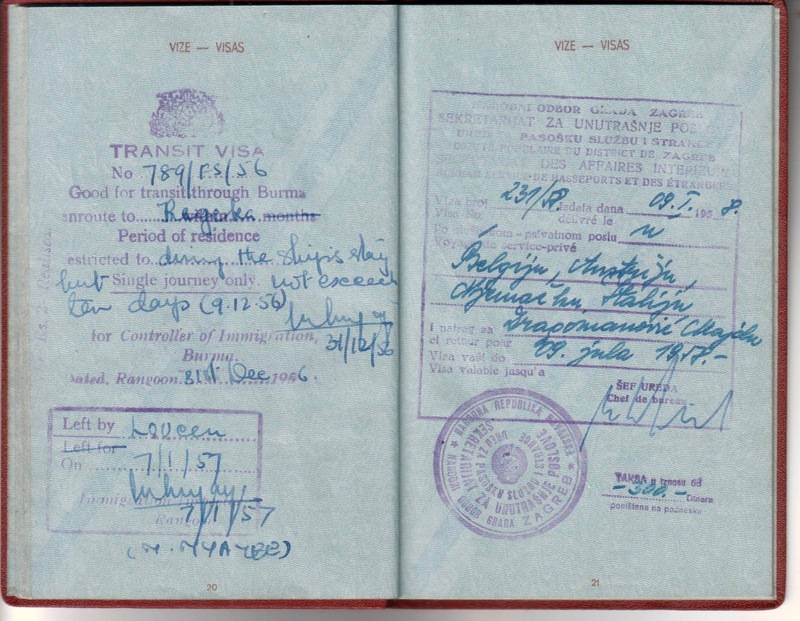 It must have been an exciting time for her - deciding to up and leave her country in the midst of a radical war and in hopes of greener pastures! Of course, maybe she was terrified by the thought of leaving all she ever knew until that point in her life, and maybe she did not want to leave, but the fact that she did leave (most likely to escape the threat of the ongoing war on her safety) is a very interesting story for it would be the product of an infamous era of our history. There is a possibility that Miss Dan My Diem is still alive to tell her story and confirm or disprove my theories as she was born in 1949 and would be 61 today. 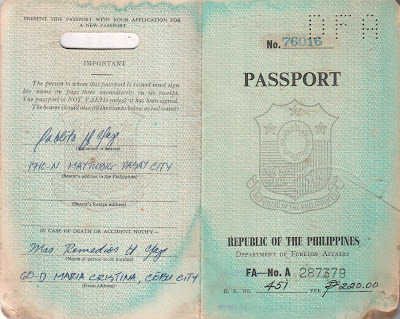 If she is still alive, she might be in the United States as that is where this passport was found. Did she manage to make it all the way across the Pacific in search of a better life? Why did she? Was it because her life in Hong Kong terrible? Unbearable? And if she did, how did she? Was she granted leave to enter the United States with refugee status? 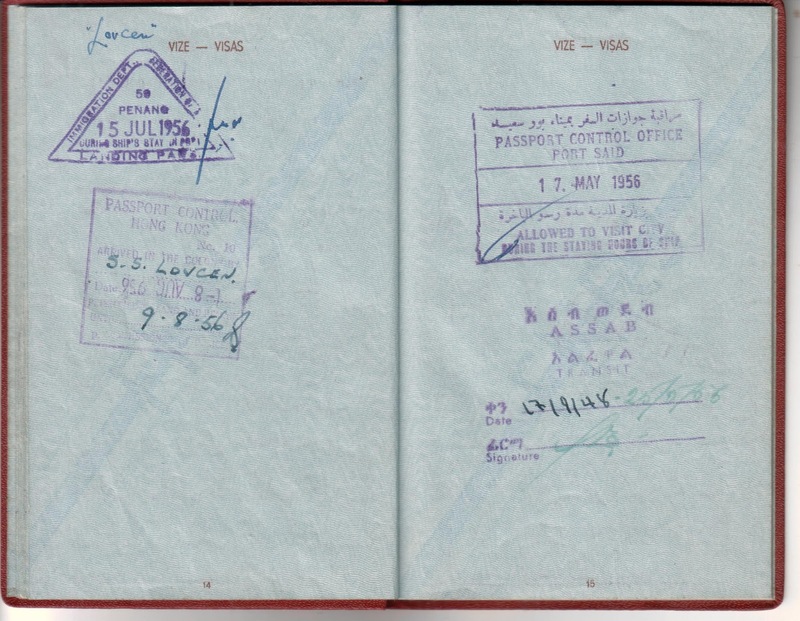 She certainly id not use this passport for her onward travel, so she either stayed in Hong Kong for more than two years (the passport expired in 1970) or maybe she procured fake travel documents for her onward voyage to America? 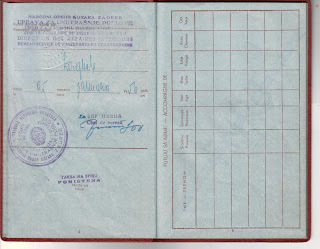 There are many spaces in the passport for renewals and extensions and all are blank. Did she have to go into hiding? 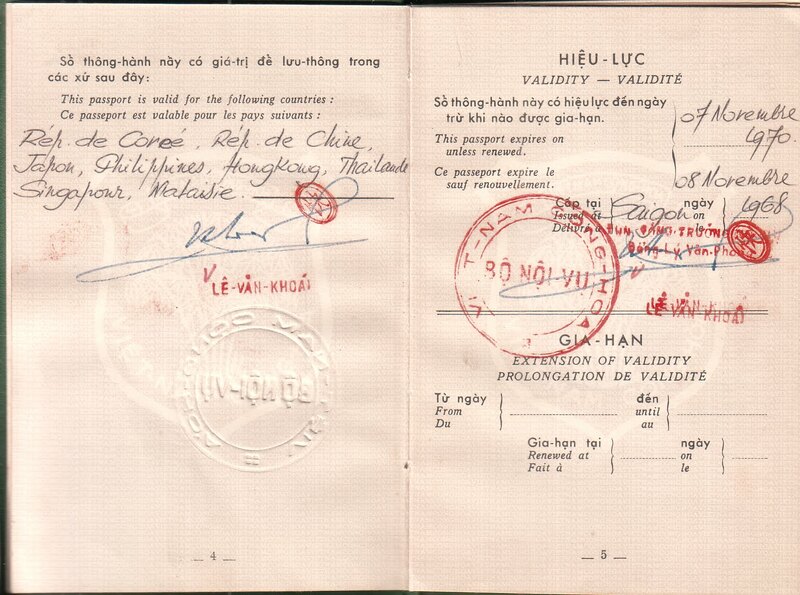 Did the Vietnamese government condemn those who fled the country and, if so, is that why she had to procure other travel documents that this one? Or did she return to Vietnam? If so, how did this passport make its way to California, where its seller lives? There are so many questions and so few answers, but that is the beauty of collecting such items as these: they tell you a story and leave it to your imagination to get carried away with trying to figure out the rest of it. 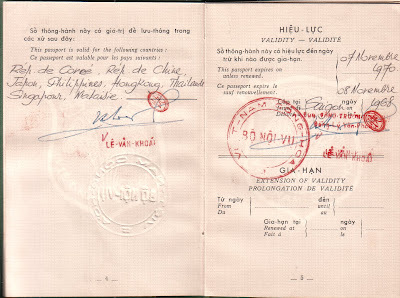 Above is an exit visa that reads in Vietnam and English, "Issued to Mlle. [Mademoiselle] Dan My Diem. 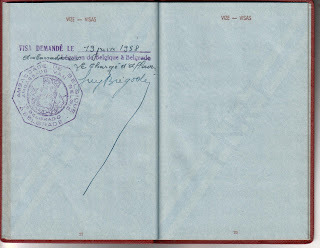 Authorized to travel to Rep. de Coree [Korea], Rep. de Chine, Japon, Philippines, HongKong, Thailande, Singapour, Malaisie and to return within un mois [one month]. 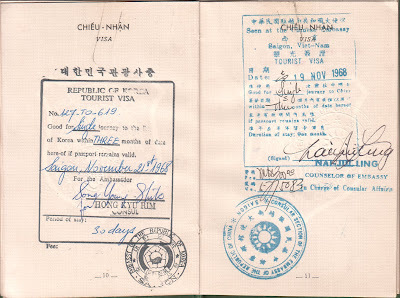 This visa is valid for (?????) 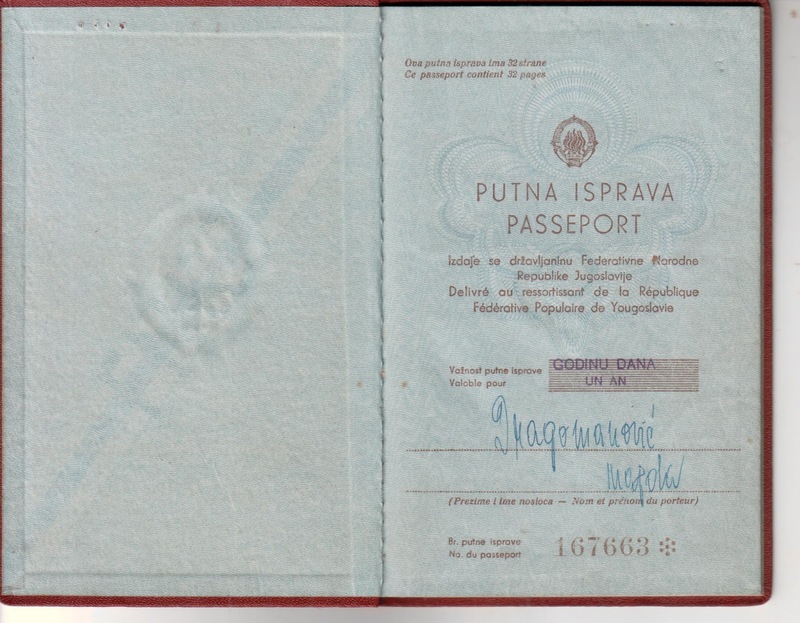 from the date of issue. Saigon, 13 Novembre 1968."